In a new statement to the press, Sefati Consulting Group — a leading enterprise SEO agency — shares its top five tips for large-scale SEO efforts. Search engine optimization (SEO) is always changing, due to such diverse factors as Google updates, evolving technologies and shifting user expectations. Large enterprises must adapt their SEO efforts accordingly, but that can be easier said than done. 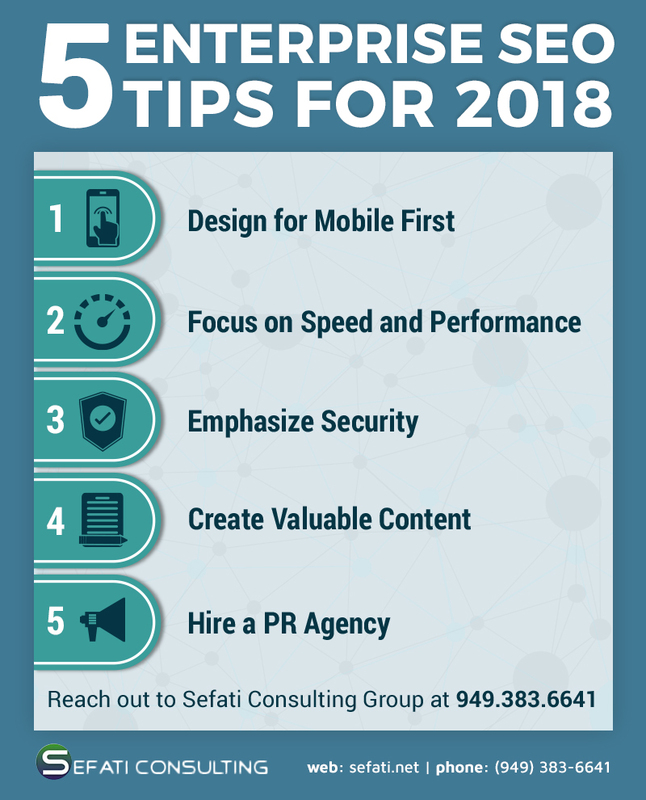 In a new statement to the press, Sefati Consulting Group — a leading enterprise SEO agency — reveals its top five enterprise SEO tips for 2018. A second enterprise SEO suggestion is to ensure speed and performance. “Your users will not wait more than two or three seconds for the page to load, so run speed tests and ensure that your site loads without any fuss and without any delay,” Sefati recommends. He goes on to say that security, too, is essential. “One of our most significant enterprise SEO tips is to provide users with a secure browsing experience — and that means embracing SSL/https,” Sefati affirms. This is especially critical for e-commerce sites. A final tip is to hire a PR agency — specifically for the purpose of link-building. More details about Sefati Consulting Group may be found at www.sefati.net. A data-driven search marketing firm in Orange County, California, Sefati Consulting Group boasts years of experience, a high degree of technical expertise, robust content creation capabilities and certification in several leading enterprise SEO tools. Sefati Consulting Group is known for its personal approach, tailored to meet the needs, goals and budgets of each client. More information about Sefati Consulting Group is available at www.sefati.net.